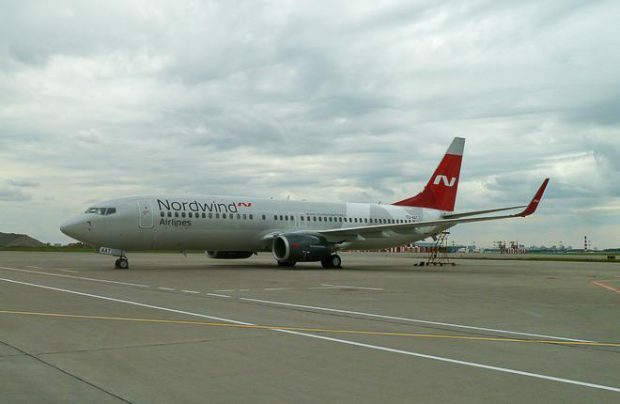 A Boeing 737-800 painted in the livery of Nordwind Airlines has been sighted at Moscow’s Sheremetyevo Airport. The aircraft is still bearing the TC-AAT registration code from its previous operator, Turkey’s Pegasus Airlines. A source at NordWind told Russian Aviation Insider that the aircraft is currently undergoing customs clearance procedures and local re-registration as VP-BSP. The first commercial flight with the new operator, scheduled for July 7, will be to Tehran. The winglet-equipped airliner is fitted with 189 Zodiac Airspace-produced passenger seats configured in a single-class all-economy setting. The age of the airliner is reportedly 7.3 years. According to open sources, the aircraft was ferried from Istanbul to NordWind’s base at Sheremetyevo on June 30. This -800 will be the seventh of the type in Nordwind’s fleet. The previous two airplanes (VP-BYW and BP-BYX) were delivered to the airline in June this year. With the newly arrived aircraft counted in, Nordwind’s fleet has expanded by eight aircraft since the beginning of this year. The carrier expects the arrival of two Airbus A330s in July. The airline’s total fleet now stands at 18 aircraft, including seven 737s, seven Airbus A321s, and four Boeing 777s. Nordwind is Russia’s ninths largest airline by passenger traffic. It carried 788,900 passengers from January to May this year, up nearly 120% on the same period in 2016. In line with the airline’s fleet expansion and renewal plan, which stretches through April 2018, Nordwind is expected to acquire 10 more aircraft. As capacity grows, the share of scheduled service is expcted to increase, eventually reaching 50% of the entire traffic. On June 30, Nordwind reported that it had carried 1 million passengers on regular flights. The airline says its traffic on scheduled routes surged 30 times between January and May 2017.